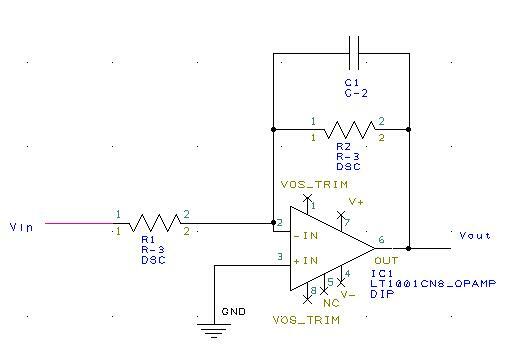 This page contains a practice assignment for making a schematic and a pcb. Refer to the PCB_Artist tutorial for information on how to finish it. We are going to make a leaky integrator schematic and pcb. You can read about leaky integrators here in the integrator section. This circuit will consist of 2 resistors, 1 capacitor and an op-amp (such as LT1001CN8). We are going to make the following schematic. You already have the resistor and capacitor components, but the op-amp component does not exist yet. Search for a datasheet of the LT1001CN8 precision operational amplifier. (You can search on google, digikey...etc). To create the schematic symbol, you can either draw your own schematic for the 8pin op-amp as shown above OR you can find the existing schematic symbol under one of the existing libraries (hint op-amps are integrated circuits(IC)). If you make your own, make sure you have 8 pins. 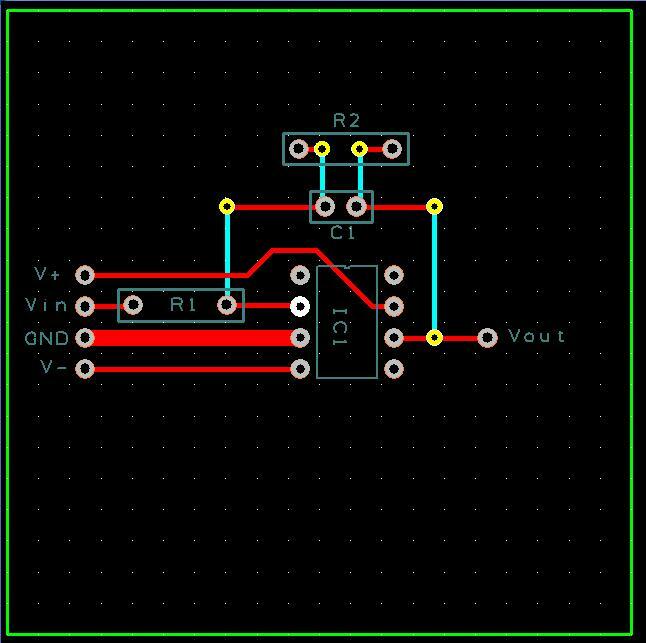 You will have to make the pcb footprint for this op-amp using the tools from the tutorial. You will need to add extra text for Vin and Vout. Now we will make the PCB of this circuit. Use 'Translate to PCB' as in the tutorial to convert your schematic into a pcb. Name your board with a 1 week turn around time and quantity of 1. This page was last modified on 10 January 2010, at 08:44.